The LRN (Learn) tenet in my philosophy refers to improving as an individual and helping others grow. In an earlier post I described the Project of the Month technique in which you learn something new by focusing on it for a month. A related LRN technique is to expose yourself throughout life to a range of new ideas, viewpoints, and concepts across multiple disciplines. I call the technique Breadth of Fresh Air. The goal is awareness and stimulation, not expertise. You may find some of the ideas intriguing to you, and you may decide to explore a few of them further either as Project of the Month topics or as in-depth subjects to which you devote months or years. Listing a few of my favorite sources for new ideas. Suggesting ways to make this technique a part of your life. I suggest reading through the entire post before clicking on the links so you get exposure to the content of this post. The end of the post provides a "starter set" list of videos to watch as examples. The purpose of the Breadth of Fresh Air technique is to briefly expose yourself throughout life to a range of new ideas, viewpoints, and concepts across multiple disciplines that can be a catalyst for better ideas. Why briefly expose? This particular technique is about breadth (verus depth) of knowledge. It is not about becoming an expert in a topic. It is about becoming aware of ideas and what other people are doing and thinking. Exposure typically will not provide any skills or competencies, but it can be an instigator for change and it may uncover new thoughts you can apply to your current knowledge and ideas. Exposure does not take long, allowing you to cover a variety of topics in short periods of time. Why throughout life? Personal growth throughout life requires ongoing learning, stimulation, and inspiration. Structured learning should not end after formal schooling. Why new? The newness is in comparison to your existing ideas, viewpoints, and concepts. They may or may not be new to the world's knowledge. While exposure to ideas similar to yours gives confirmation and can help strengthen your own thoughts, this technique is about stimulating your mind, challenging and expanding your own ideas, and discovering new interests. Why multiple disciplines? Humanities (like history, arts, and literature), social sciences, natural sciences, formal sciences, applied sciences, and professions cover the majority of human knowledge. Exposure to pieces of each of these disciplines can make you a more well-rounded person. It provides opportunities for you to cross-fertilize your existing knowledge with these new ideas from other areas. If you only think of hammers and nails and you become exposed to screwdrivers, screws, and adhesives, you may find better solutions to problems you encounter. Why catalyst for better ideas? The ideas you want to expose yourself should be of quality, meaningful, positive, and beneficial. There are a variety of traditional sources available to expose you to great ideas, such as books and magazines, seminars and conferences, schools, conversations with experts and friends, and government and non-profit organizations. These are all wonderful and should be utilized if you have access to them. I have listed a few examples at the bottom of this section. We are fortunate to live in a time where access to a variety of interesting and quality ideas is fairly easy and on demand due to both technology (the internet and electronic devices) and the generosity of people and organizations that provide this information. A few organizations encourage and facilitate this Breadth of Fresh Air technique through their websites and mobile apps. These organizations provide exposure to new ideas, viewpoints, and concepts at no cost to the public. The speakers are vetted so they are of good quality and are meaningful. The ideas are presented through video, which helps visual and auditory learners and can be more engaging. And access to the talks are available through websites (and in some cases also through mobile apps), so they are convenient and easy to view. Here are my favorites, along with the links so you can access them. TED (which is an acronym of Technology, Entertainment, Design) is a group “devoted to Ideas Worth Spreading”. It has expanded from the original focus to include science, business, the arts, and global issues, which makes it an excellent source for breadth of ideas. It hosts a few multi-day conferences each year where dozens of invited speakers give 18-minute talks. Videos of the best of these talks are made freely available through their website and through apps. The videos are excellent, cover a variety of topics, and are intellectually stimulating. RSA (which is an acronym of Royal Society for the encouragement of Arts, Manufactures and Commerce) is a group founded in England in 1754 that “seeks to develop and promote new ways of thinking about human fulfillment and social progress.” It hosts talks and discussions by experts. RSA introduced a new series of videos in 2010 called RSA Animate. The audio of a talk is “animated” by videotaping a graphic note taking session. This approach allows visual and audio learning from a speech and helps engage the viewer. There are several videos available for viewing. Some of them may only be available for access in the United States. Do Lectures believes “That people who Do things, can inspire the rest of us to go and Do things too.” The organization is based in Wales (United Kingdom) and holds a conference each year at a farm. Gel (which is an acronym for Good Experience Live) is a conference and community “exploring good experience in all its forms – in art, business, technology, society, and life.” It has made its videos from previous Gel Conferences available online. There are thousands of examples of other sources all around us. Many websites are devoted to a narrow topic (such as food, travel, science, or technology), but breadth and variety is the focus of this technique. Here are a few I recommend because of the quality of the information and variety of the topics. Smithsonian magazine - This monthly magazine (available online at http://www.smithsonianmag.com/) usually has articles covering history, archaeology, people, places, arts, travel, science, and nature. It also has over 300 videos for viewing. The New Yorker magazine - This weekly magazine (some stories available online at http://www.newyorker.com/) has high-quality articles on a variety of topics, from current events to art to politics to travel. Even the cartoons can expose you to ideas. The U.S. government - The amount of information produced by the U.S. government is staggering, available for free, and accessible starting from the U.S. government website at http://www.usa.gov/Citizen/Topics/All_Topics.shtml. This is really a portal to in-depth educational sites, but I list it here because spending some time clicking on this site can give you an awareness of what is available on history, arts, culture, libraries, national parks, etc. Project Guttenberg - This is a collection of over 33,000 free electronic books that you can download (available at http://www.gutenberg.org/wiki/Main_Page). Read the classics of fiction and non-fiction, from philosophers to poets, to expose yourself to ideas, viewpoints, and concepts from great minds. Make the sources of ideas easily accessible. One suggestion is to bookmark the links listed earlier in this post in your favorite web browser. Add your own as you find additional online sources that you want to access frequently. 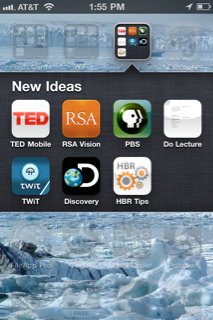 If you have a smartphone or tablet, create a page or folder with the apps and links you want to access. This will make it more convenient for you to access in the future. Set aside time on a regular basis to view these sources. You are more likely to establish a routine if you schedule some time each week or month to scan through the sources of ideas. Because many of these videos on the recommended websites are between 5 and 20 minutes in length, you may be able to fit in one or two videos during daily commutes, while eating, or brushing your teeth. Share and discuss them with others. This can allow you to gain additional insights from others and deepen your awareness of the ideas presented. Watch together and you can discuss afterwards. Here is a starter set of videos. I picked them because of the variety. Happy Breadth of Fresh Air-ing!